The long-term battle being played in the UK housing market is that of limited new build supply always trying to play catchup with ever increasing demands as a consequence of the UK's growing population and changing demographics which is set against many other developed countries that are either experiencing falling populations such as Germany and Japan or have ample space to build far beyond that demanded as a consequence of population growth such as the United States and of course not forgetting eastern europe as a consequence of emigration. Therefore this analysis as part of a series on the UK housing market seeks to gauge the likely impact of population growth and the ageing demographics crisis on UK house prices over the next 20 years. However, the updated graph shows an actual trend trajectory as per the most recent ONS population data of into Mid 2012 of 63.7 million and an estimate of into Mid 2013 of 64.3 million which suggests that the UK population could increase by an additional 4 million by 2030 as a consequence of what amounts to out of control immigration and its birth rate consequences that translates into a population increase equivalent to 15 cities the size of Birmingham. The actual rate of annual immigration was 240,000, near 20 times the Labour governments propaganda that continued for many years into Mid 2000's despite clear evidence of mass immigration being under way. The latest manifestation of the immigration catastrophe is well under way as hordes of Romanian and Bulgarian workers and benefits claimers that if follow what transpired during the past decade will turn out to be 20 times the academic estimates. The recent movie Elysium depicts what in many respects has been taking place in the UK this past decade as hordes of economic migrants from across the world have descended upon Elysium (Britain) that under the weight of which risks Britain's economic social and cultural destruction. Whilst many mainstream politicians of both Britain, Bulgaria and Romania may argue that those who will come to the UK will mostly be along the lines of the last mass migration from the likes of Poland i.e. young hard working individuals, however there are two problems in that most of the young hard working Bulgarians and Romanians have already migrated (estimated 300,000) to the UK during the past 5 years via a whole host of avenues such as work permits and low skilled quota schemes, and the fake self employment loop hole, secondly that virtually all of these are low paid workers who are in receipt of TAX CREDITS, thus the net effect of eastern european workers is to INCREASE the tax burden as LESS is paid in taxes than is paid out as TAX CREDITS. The current situation of a completely open door policy is further exacerbated because it is not just the Bulgarian's and Romanian's from the countries of origin that could flood Britain but also the estimated 3 million who have already migrated to the Southern European states such as Spain and Italy who following the drop of border controls many of whom look set to make the move to a better paying Britain both in terms of wages and benefits and in terms of the availability of low paid jobs. Therefore this is a recipe for an immigration catastrophe because as many as 1 million Romanian and Bulgarian's could migrate to Britain over the next 2 years, far beyond anything that can be envisaged by that which is being reported of in the mainstream press of a high 50,000 per year, and it is very telling that the coalition government refuses to release the estimate of how many migrants will arrive during 2014 as the government chooses to keep their reports and estimates a secret from the people instead pretend not to have undertaken any study. One of the few politicians who has made a forecast is the Bulgarian Ambassador who forecasts just 8,000 per year when the actual number of Bulgarians is likely to be THIRTY TIMES official propaganda. Thus it is highly probable that many of the future arrivals from Bulgaria and Romania will tend to be poor families who will seek to target Britains welfare system both in terms of benefits and tax credits for low paid workers as the level of poverty in the newest members states are at European extremes that the likes of the Roma communities have experienced in the former Czechoslovakia, in which case the calculations will be pretty easy for most migrants to make for why would a family subsisting in Romania or Bulgaria on less than 1/10th the resources that will be available in the UK not migrate whole families to Britain who will have the same rights as any British citizen for access to the whole host of services and benefits available from housing, hard cash, schools and the NHS. After all, if Britain's population could similarly attain an income that was near ten times the benefits cap of £26,000 in another european state (£260,000), then the UK would also likely witness a mass exodus of many benefits and low income families out of Britain. And this does not take into account the Roma crime wave and civil disorder that may parts of Britain are experiencing that even a former Labour home secretary warns could result in riots during 2014. Locked away in their ivory towers, academia tended to favour mass immigration for its positive consequences in terms of managing the economy i.e. as mentioned earlier mass immigration tends to drive down wages and therefore allowed an economic boom to take place without inflation consequences, as each annual wave poured water on the burning embers of a wage price spiral hence why many academic papers were written (propaganda) for the political paymasters in support of high immigration without ever contemplating the consequence in terms of debt as British workers with increasingly depressed wages were forced to borrow to mainstream standards of living and in terms of lack of housing and welfare services from schools and healthcare for Labours extra 2 million influx that went some way to explain why despite increasing spending on services, it always seemed never to make much difference to peoples real life experiences of the likes of the NHS. The Leaders and representatives of both major parties have been busy making statements promising to control immigration in the future, however these amount to nothing more than bare faced lies when one considers the real fundamental drivers for immigration because if the politicians were really serious about controlling immigration than it would already have been done! Labour supports unlimited immigration because the vast majority of immigrants will tend to vote Labour i.e. be politically left of centre, therefore Labour sees immigration ultimately in terms of hundreds of thousands of new Labour voters who will ensure further election victories. Labour's strategy has therefore been highly successful as in a little over 10 years it has changed many constituencies in favour of voting Labour to the point where it has become near impossible for the Conservatives to win elections with significant majorities such as the landslides achieved by Margaret Thatcher during the 1980's. Conservatives support immigration because it is highly profitable for their pay masters - big business, as the influx of migrant workers will tend to drive down wages for all workers thus deliver higher profits for business. Academic economists may rightly argue that by doing so businesses will ultimately erode their own profits as workers who earn less also spend less. However what academics fail to appreciate is that the state steps in to fill the gap by subsidising workers through tax credits and funding the lifestyles of some 8 million people who are economically inactive all of which is paid for by money conjured out of thin air i.e. government debt that is not backed by any economic activity that acts to inflate the economy, and thus corporate profits which are leveraged to inflation. The Conservative led Coalition boasts that it has cut net migration by a third, but what they forget to mention is that only immigration from OUTSIDE of the EU has been cut i.e. many of whom would be highly skilled workers, who instead of being reliant on the state would have paid taxes. Additionally the Conservatives conveniently tend to forget that the Borders Agency has been an abysmal failure that routinely allows in many tens of thousands of illegal migrants that go unrecorded each year. Therefore one should realise that high net immigration is in the interests of both major political parties both in terms of votes and for those that bankroll the parties, which means that neither Labour nor Conservatives will actually do anything significant in respect of controlling immigration, so everything you are hearing in the mainstream media from the politicians such as Cameron promising a referendum in 2017, some 2 years AFTER the next election is purely smoke and mirrors BS to mislead the population into thinking that something will eventually be done about Britain's immigration crisis. So, yes each party may announce plenty of policies and massage the figures in the run upto the next general election, but they will break ALL of their immigration promises just as they have done so before because it is not in either main parties interests to control immigration. A possible solution to Britain's immigration crisis is for politically corrupt eastern european countries such as Bulgaria and Romania to replicate the British political, legal, social and cultural system, therefore Britain rather than opening its doors instead Bulgaria and Romania should open their doors to hordes of British technocrats so that they can implement a blue print for constructing a modern democratic British colony, it's not as far fetched as it may sound as the euro-zone effectively replaced democratically elected governments with technocrats in several european countries such as Mario Monti's in Italy. The only stumbling block is would the corrupt eastern european politicians give up power? Rising house prices meets housing benefits cuts, benefits culture cap resulting in private Landlords increasingly making the financially commonsense decision to evict not just benefit claimants heavily in arrears but virtually all of their benefit claiming tenants in favour of far more reliable hard working eastern european workers. This is the natural consequences of rising house prices as rental yields tend to track house price rises where the average annualised rise of 8.5% implies average rents could be raised by 8.5% which pushes benefits claimants increasingly into arrears and thus prompting Landlords to seek more reliable rent paying tenants as the Coalition government has desperately been attempting to cut what had become out control housing benefits payments to 4.5 million households under the Labour government that at its extreme had manifested itself in rental payments of over £100,000 per annum each to over 100 families that are now subject to the benefits cap. 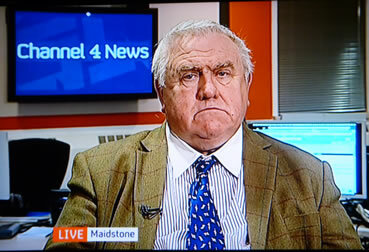 Channel 4 News recently ran a story that illustrates what is taking place in Britain's property rentals market as one landlord explained why he has served eviction notices on 200 housing benefit claiming tenants thus forcing the tenants back onto already swamped public sector housing as a further example of what amounts to out of control immigration resulting in relentlessly building demand pressures right across sectors of economy. The benefit cuts already brought in by the government are starting to have one unforeseen consequence some private landlords are refusing to house people on benefits at all, take the wealthy property owner Fergus Wilson and his wife Judith, two former maths teachers turned property tycoons have served eviction notices on 200 families who depend on welfare to cover their rent and he joins me now. Fergus Wilson your not the only private landlord doing this so where are people on benefits supposed to live? Well, that is a matter for the local authority, but the difficulty for the local authority is that they are full to capacity, so where do people go ? If they are single mums, they get some protection, but in reality it means bed and breakfast, if they are over 18 and have no children then the local council is under no obligation to house them. But your kicking them out, government cuts have what have brought all this about and the impoverished tenants are taking the flack aren't they ? So people say your a bit heartless, do you think your heartless? Well if I am heartless then so all of the other landlords are heartless because were all doing the same. But do you think your being unfair, your worth £240 million pounds, do you think you need to put rents up? Yes I do, the situation is this if house prices go up then the rents go up in proportion, that's commonsense. All of our properties have to stand on their own two feet, its not a house of cards, if a property has a tenant who cannot afford the rent then the mortgage does not get paid and we would lose the house as well as the tenant, that's rather silly, if we have a person who is working who may be an eastern european, it is our experience you do not have defaults. I must tell you I have not had anyone in the last 2 years who was working fail to pay a penny, but as far as people on housing benefits we are now over 50% in arrears, so its a pretty simple choice. However, it is not as black and white as the Channel 4 story implies for many immigrants of especially the more recent waves out of Romania and Bulgaria can be even worse tenants than British benefit claimants as for months many landlords have been informing me of their negative experiences where Roma and other eastern european tenants who will say anything to gain a privately rented property by offering to pay higher rents and pay for several months up front, but then the experience is that no further payments are made where the Roma / Romanian tenants give the story that they have lost their jobs and then refuse to leave properties as Landlords are forced to go through the lengthy eviction process that usually results in the return of a stripped down wrecked property with inability to gain recompense from the tenants who have moved on to their next victim. And where the welfare bill and immigration are concerned it should be noted that benefits such as housing and tax credits are available to all workers including low paid eastern european workers who will be in receipt of housing and other benefits that far out weigh taxes paid and hence demonstrates how where the property rental market is concerned immigrant demand is displacing British claimants rental opportunities whilst adding to the benefits bill. At the end of the day the immigrant demand pressures are a wake up call for many of Britain's 8 million benefits for life claimers to get of their lazy back sides and into work as the immigrants illustrate that there is always work to be done because the twin forces of the state being increasingly financially unable to provide them with a free lunch from cradle to grave, coupled with continuing out of control immigration results in cost of living increases far beyond the rate that benefits are indexed to right upto the benefits cap that should increasingly force the 8 million non working benefit claimants to work as do the other 28 million hard working Brit's whom many claimants have been living off their whole adult lives despite no real reason other than a generational entitlement culture of laziness for the reason why they have made a life style choice not to work. The graph illustrates a major long-term shift took place in the UK housing market dynamics by 2000 when the annual increase in population started to far exceed the number of new builds that ended the preceding trend for construction to exceed population growth in terms of addressing the UK's chronic long standing housing shortage, especially considering that the average size of households has continued to shrink falling from 3.1 in 1960 to just 2.25 in 2013 (one of the lowest in the world) as a consequence of the increase in single person households and single parent families. Therefore instead of increasing house building during the immigration catastrophe the exact opposite has taken place as far fewer houses were built each year than during the preceding decade This ratio is only trending in one direction i.e. lower which means that even if the UK population suddenly stopped increasing then the falling ratio towards 2.15 by 2030 would imply demand for an EXTRA 1.25 million properties. The below graph further illustrates the ratio between the accumulative change in population since 1970 against the accumulative number of new housing builds also since 1970 as a ratio that shows the level of UK over crowding. This better illustrates the change in trend that started to take place during the mid 1980's that coincided with the Thatcher governments reversal of the policy for the construction of social housing and implementation of the right to buy programme that resulted in the sale of millions of socially owned local council housing that ignited the property boom of the nineties AND noughties, the trend that was set in motion was for the inability of supply to keep pace with population growth which ensured continuously persistent upward pressure on house prices that despite the great recession still showed an accelerating trend as new build supply that currently stands at an estimated 140k per year is set against government estimates for a requirement of at least 250k per year, with 300k a more realistic estimate when the trend for a falling household size is taken into account, which thus ensures that the UK's over crowding situation is expected to continue to worsen year on year going forward, especially if the size of average households continues to shrink which would require 70,000 new builds per year even if the population stopped increasing. New build supply plays an important role in the housing market as it tends to average at approx 10% of the total number of annual transactions, which is more than enough to have a significant effect on the UK housing market especially as supply over recent decades has been consistently below that which is deemed necessary to meet the demands of a growing population which meant that the UK housing market was never destined to replicate the housing busts of countries such as the United States or even closer to home of countries such as Spain, where that housing bust has prompted many hundreds of thousands of British ex-pats to cut their losses and return to the UK, closely followed by unemployed Spanish and other PIIGS citizens seeking employment in a far more liberal and robust UK jobs market and thus introduce new demand into the UK housing market. This suggests that the often put forward academic standards in terms of valuing the housing market affordability ratios such as X3.5 salary towards the likely path for the UK house prices does not take into account that of new demand against new supply trend that implies affordability ratios look set to be pushed ever higher to new trend extremes, and therefore supporting long-term rising price trends for UK house prices in real terms, i.e. expensive UK house prices look set to be here to stay for as long as the lack of new supply exists, especially as the UK population is expected to grow by at least another 5 million over the next 10 years and probably nearer 6 million which demands at least an extra 2.5 million homes to be built which is set against an realistic estimated construction of just 1.4 million new homes, which means UK over crowding is going to continue to get much worse and thus drive house prices ever higher. The bottom line is Britain's over crowding ratio insures that no matter what the arguments are put forward by academics that many people just cannot afford to buy so house price rises must be unsustainable, instead the population growth fundamentals are such that their argument just does not matter, the only thing that can effect this fundamental trend is if the UK literally doubled the number of houses built per year, and even then it would not result in a fall in house prices but tend to index house prices to inflation. But off course that is not going to happen, the UK is not going to build anywhere near 300,000 homes per year, as the reality is that for most years UK house building will be short by as much as 150,000 completed new builds each year which will just compound the housing market demand vs supply pressures and thus exert further upward pressure on house prices. Britain's demographic crisis as illustrated by an ever growing ageing population that despite an increasing number of workers due to immigration cannot maintain ratios of the past, where 20 years ago there were 8.9 million pensioners against 28 million workers or a ratio of 3.15 workers to every retiree (15.5% of the total population), today there are over 11.5 million pensioners to 30 million workers, a ratio of 2.6 to 1 (18.1% of the total population). Britain's growing elderly population demanding an ever greater share of the economic pie that puts an ever increasing burden on the welfare state services such as the NHS that will continue to severely impact the economy. The consequences of Britain's demographics are as I pointed out 4 years ago in the Inflation Mega-trend ebook of Jan 2010 (FREE DOWNLOAD), that governments only ever have one solution which is to PRINT MONEY be it called debt that will never be repaid or QE or a multitude of other examples such as Funding for Lending, and the consequences of the perpetual exponential money printing is as I have written about on a near monthly basis for at least 7 years is continuous exponential inflation. This is why whenever I hear warnings of deflation, I consider the proponents as being delusional because there has not been nor ever will be DEFLATION! Thankfully it is not all gloom and doom as the current coalition government as well as future governments will increasingly recognise the exploding demographic time bomb and thus will actively engage (belatedly) in an attempt to alleviate the disastrous long-term consequences by both gradually raising the retirement age, which will probably be raised to at least 70 by 2025, as well as cutting the burden of costs that are presently dumped onto the tax payers. Whilst both ends of the spectrum i.e. those retiring and those entering the workforce will both feel outraged at their own increasing costs, and diminishing services, however there is no way out of the demographics crisis other than for unpopular policies to be implemented as the alternative would be an hyperinflationary economic collapse, as successive weak governments have kept putting off the difficult decisions by taking the easy option of just printing money and monetizing government debt (as was the policy of the last Labour Government) which would wipe out the purchasing power of both earnings and savings and give the illusion of growth. Other positive developments in recent years have been to address the problem of ageism so that people above a certain age are no longer seen as unemployable, the UK in this regard has come a long way over the past 10 years with now over 1 million pensioners working in retirement which coupled with extension of the retirement age should be seen as a positive trend until ultimately retirement would be resigned to the history books much as communism has been. After all retirement was never a sustainable policy as it was built upon the assumption that the ratio of workers to retirees would be sustainable at above X3, instead of the current trend towards below X2. Whilst more elderly in the workplace over recent years has resulted in an improvement in the overall economy in terms of productivity in utilising what would have been an idle workforce, however as mentioned earlier, it does not resolve the tax and debt burden being placed onto future generations, which does confirm my view that at some point the retirement age will be scrapped altogether and along with it the state retirement pension to be replaced with a form of income support for low paid elderly workers, along the same lines as the current tax credits system. Though the problem here is political as the elderly are more likely to vote and therefore carry a far greater influence on government policies which given a rising elderly population can only increase. Therefore political parties have little choice but to lie to the grey vote to get elected and then break their promises citing economic fundamentals. The objection put forward by many against an effective end to retirement is that it takes jobs away from the young, however this is a false premise as those starting out at the beginning of their careers are at a different stage of development than those that are in the last few years of their careers, just as those in their 40's usually do not compete against those in their 20's therefore even less so will those in their 60's and 70's, if anything it will allow for more efficient transfer of knowledge and experience between old and young workers rather than having an artificial cut off date. So whilst out of control immigration of the past 10 years has been very bad in terms consuming resources and drawing on benefits, it does however have a silver lining as the children of the immigrants will bear the burden (as will all born during the past 25 years) of the demographic crisis, which will hopefully buy Britain time for its inept politicians and technological advances to alleviate the consequences of, which by 2030 could imply that 1.9 workers per retiree could be sustainable. Whilst the focus of this analysis so far has been the ratio of workers to retirees, however Britain also carries the burden of its benefits culture which has 8.9 million people of working age who are sat idle, this is set against the official unemployment rate of just 2.4 million which results in an unrecorded economically inactive gap of 6.5 million which illustrates the true extent of the failure of the last Labour government to manage the potential of the work force during the boom years as illustrated by the fact that 80% of the 2.1 million jobs created under Labour went to foreign workers and therefore did nothing to address the true level of UK unemployment that contained a hidden ticking social security financing time bomb that has exploded as an extra £40 billion annual budget deficit that still persists. Off course not all of those that are economically inactive can work such as through disablement or long-term illness, nevertheless the real level of unemployment if including those that can work but choose not to work then the real level of unemployment is nearer to 5.5 million rather than the official level of 2.4 million. Therefore the coalition government has been correct in recognising this huge and unsustainable burden on the state by implementing measures to force those of working age to actively seek employment rather than remain a burden on the state for their entire working lives and then again during retirement, which would have the dual effect of turning many millions of today's benefit claimers into tomorrows tax payers. The impact of the demographics crisis on the UK Housing market is suggestive of increasing supply from the mid to upper range of the UK housing market as many people approaching retirement will have during their working lives looked on their homes as a means of providing for them in their retirement as they expected the rise on house prices as a consequence of inflation and economic growth to result in a profit far in excess of any outstanding mortgages at the time of retirement and in most cases they will have played the property market wisely even after allowing for the depression of the past 5 years as many will be sitting on small fortunes, especially those that bought in the South of the England 30 or even 20 years ago. Therefore a significant number of retirees look set to continue to either downsize or move into retirement homes or the new retirement villages that have been springing up, which will in part free up supply to put a dampener on rampant house price inflation of what we saw during the last boom whilst INCREASING demand for smaller properties in retirement towns and areas of the country such as sea-side towns. Furthermore the psychology of seeing ones property as a retirement investment is widespread amongst all ages so continues to act as an encouragement to buy as people who cannot ever imagine that properties will ever yield less at the time of retirement than they do when bought, but instead the mindset is fixated on what has come to pass for their parents and grand parents generations. In addition to this we have the wage slaves with less real terms disposable income to pay towards housing costs in terms of mortgages which on face value implies a persistent real terms deflationary outcome for UK house prices over the next 20 years. However this has to contend with rampant immigration coupled with domestic population growth as immigrant couples tend to have larger families which coupled with the benefit culture baby making factories will result in at least an extra 10 million people, a trend that is more than capable of overcoming the deflation as a consequence of the ageing population that ultimately has to imply persistently high real rates of inflation not just for house prices but for sectors right across the economy. Furthermore as more of the benefits for life claimants are increasingly encouraged or forced into work, in addition to many more retirees continuing to work in some capacity will improve Britain's productivity which coupled with ongoing exponential technological advances will mean that a ratio of workers to retirees that is unsustainable today could be sustainable 20 years from now which ultimately translates in workers being able to support a greater proportion of wages being spent on housing costs in terms of affordability than is the case to today, which is why those fixated on affordability ratio's as compared against the past will continuously find themselves wrong footed, as ratios get ramped ever higher from 20% of income 20 years ago to 1/3rd of income today to 50% of income in 10 or so years time. Therefore the message being painted by this demographics analysis supports my long standing view that one of the only ways for people to leverage themselves to the exponent inflation mega-trend consequences is to be exposed to assets such as housing and not only that but whenever prices fall due to fluctuations in the business cycle even if not in nominal terms but just in real terms (after inflation) than home buyers should seize the opportunity presented because the over riding trend for house prices over the next 20 years will be for only in one direction! 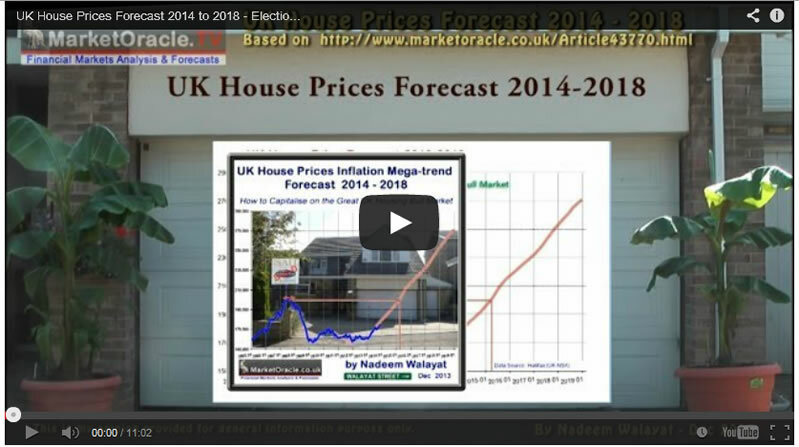 A doubling then tripling in house prices by 2030! Where ALL of the risks are to the UPSIDE, i.e. 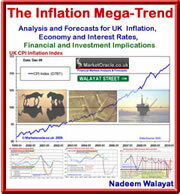 out of control inflation which may in its immediate aftermath result in a real terms drop but which would sow the seeds for the next ramping higher in house prices just as the Great Recession house prices depression had concluded in the embryonic bull market of 2012. In terms of towards formulating a house prices forecast trend trajectory, then this analysis is supportive of my view for a sustainable average house prices inflation rate of 10% per annum (compound) over the remainder of this decade. The Mainstream Press Nearly Always Gets it Wrong! It is ironic that at a time when I was iterating the strong probability for a multi-year UK housing bull market of approx 10% per annum at the start of 2013 that the consensus view was one of prevalent doom and gloom right across academia that even infected vested interests such as estate agents, which goes to show the role sentiment can play where the mainstream media is concerned i.e. overly pessimistic when its time to buy and overly optimistic when its time to get out! House prices in Britain will not return to their pre-recession peak until the end of the decade, making this the longest slump in the property market since records began. A report by a leading estate agent said the price of the average home peaked at £183,959 in 2007 but has fallen so dramatically it will not return to this level until 2019. The 12-year recovery period could be the longest since records began in the 1950s. The report said that once the impact of inflation is stripped out, average prices will not return to 2007 levels until 2031 – an incredible 24 years after they peaked. And at the time the likes of the Telegraph were even more pessimistic. Instead it is increasingly probable that a year from now (early 2015) that average UK house prices will have passed their 2007 highs some five years ahead of that which the mainstream press were forecasting. So the bottom line is that If you listen to the mainstream press then you will always miss the boat and both be too late to buy and too late to sell as was illustrated by the mantra of the soft landing during 2007 and 2008 whilst the UK house prices were entering a state of free fall as I repeatedly warned at the time. Royal Institution of Chartered Surveyors (RICS) - Only 10% chance of a 1990's style housing market crash, Simon Rubinsohn - 18th Sept 07. This is a barely a month after Mr Rubinsohn recommending buy to let investments - “people who were thinking of dipping their toe into the equity market may now be tempted to forget about stocks and buy to let instead”. (The Independant). Paragon, Mortgage Company - "the buy-to-let market was still strong"
This analysis is just a small excerpt of that which concluded in the UK House Prices Forecast for 2014 to 2018. Ensure you are subscribed to my always free newsletter for regular housing market updates as well as FREE download of my New UK Housing Market ebook (available from late January 2014).